I am getting excited about open studios — coming up June 7 & 8, and 14 & 15, with special preview evening Friday June 6th from 6 to 10 pm. 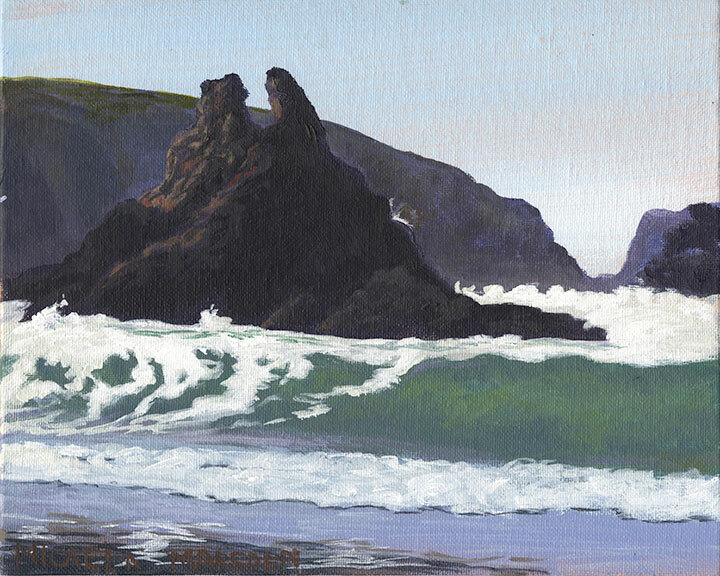 Here are two recent, small paintings from the Mendocino area at Jughandle Beach. 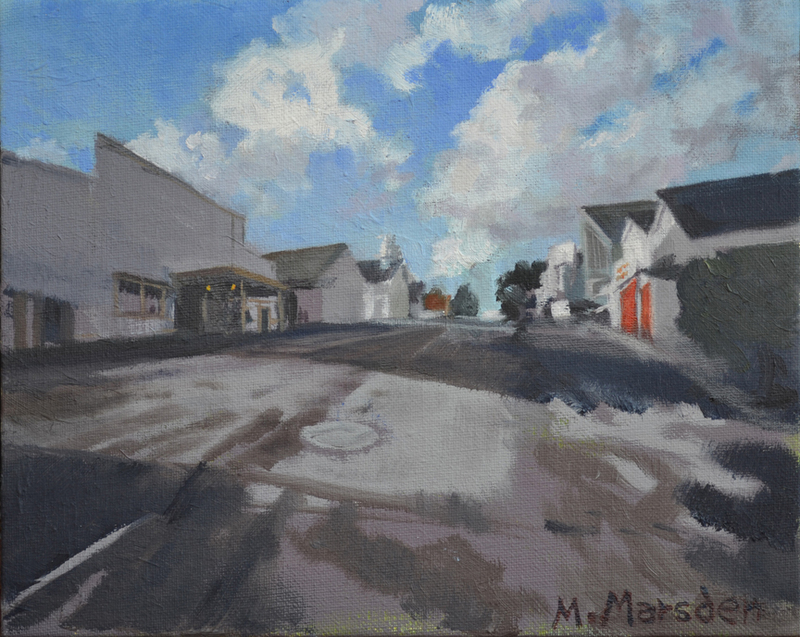 Plein Air Painters of Mendocino – Annual show! 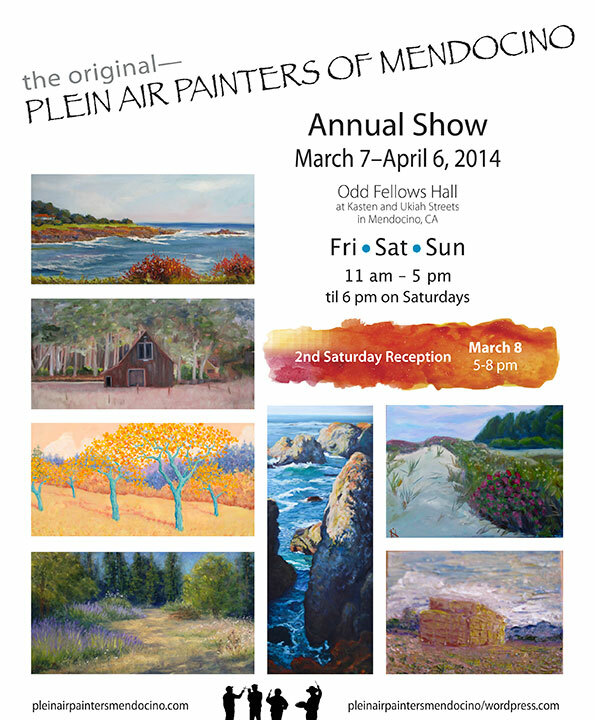 I will be participating in the Plein Air Painters of Mendocino Annual show which starts Friday, March 7. 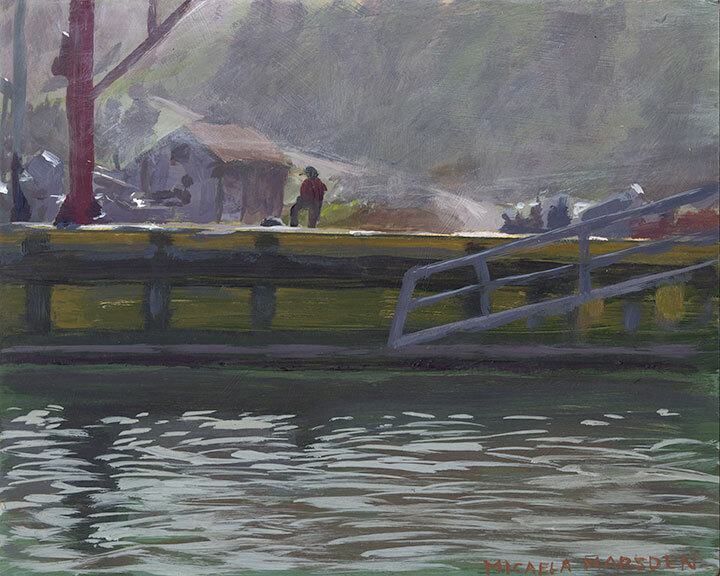 This is primarily a landscape show, as you may have guessed, with a popular subject being the beautiful Mendocino coast. If you are planning to visit the coast, this is a good month to do it as it — the whales are normally migrating north in March. They come very close to shore at this point in California, and you can easily see them at Point Cabrillo as well as all up and down the coast. Come up, and enjoy whale sighting and check out the art! 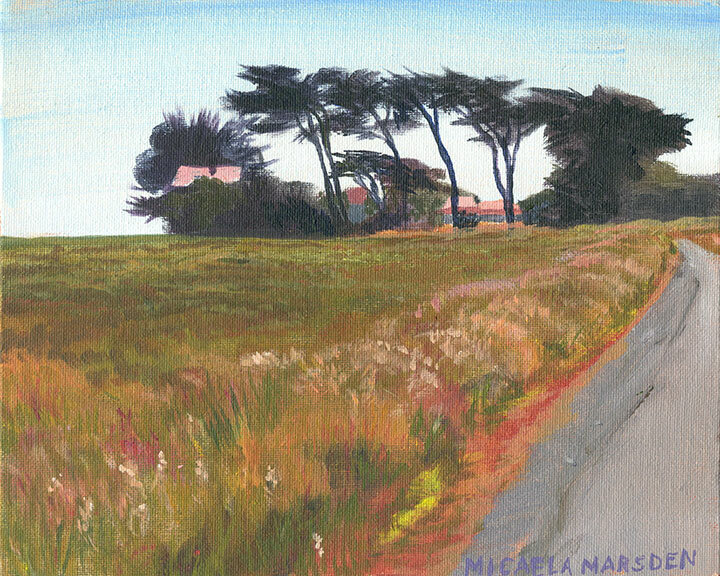 Posted on March 1, 2014 March 1, 2014 Categories Mendocino, paintingTags landscape, Mendocino, micaela marsden, oil painting, Plein Air Painters of Mendocino, Plein Air Painters of Mendocino Annual showLeave a comment on Plein Air Painters of Mendocino – Annual show! As the main commercial district, it’s pretty lively, much more so than it looks here. We could call this an experiment in seeing what a town looks like sans cars, people, dogs or even random birds. 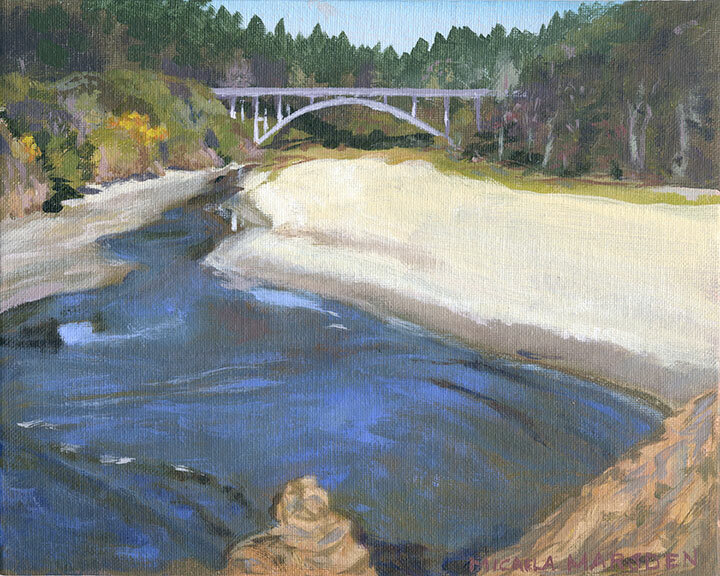 The Plein Air Painters of Mendocino will be having their annual show just a few blocks away at the Oddfellows Hall, on Kasten & Ukiah streets during the month of March (starting on the 7th). I will be participating in this show, it should be fun! I visited this place in Caspar on the north coast with a friend a month or so ago. While we were setting up our gear, an abalone diver and an oyster collector climbed down the steep cliff to the beach below. The guy hunting for oysters on the rocks scrambled around with his little dog following him everywhere like an animated flag, so that we never lost track of him except when he ducked behind one of the house-sized rocks. The diver in his colorful gear waded out and disappeared into the waves. When it got too dark to see our colors, we hefted up our gear and wet paintings, and started the short hike back. Within a few moments the diver came up beside us. We were happy to see him safe, he had an abalone for his efforts, we both had good painting starts – a good day.